Here is an early 1930’s attempt to produce an automatic winding watch. This Perpetual pendulum wind, with original ribbed bezel and restored rhodium plated filigree case and left side setting crown is very clean! The dial is original and in fine shape for its’ close to 80 years of age. 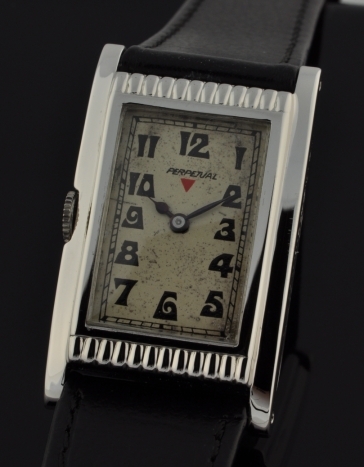 Notice the stylized Art Deco numerals with original blued steel hands on this eye-catching dial! The pendulum (original) movement was just cleaned by our watchmaker and is working perfectly This is a highly collectable vintage early automatic that is becoming VERY difficult to find! Only $1895.